Today was an overwhelming day, because I had the opportunity to be surrounded by some of the most inspiring people I have met. As part of my job as the managing editor of a parenting magazine, I help honor about a dozen changemakers for our annual Superheroes issue. Today, I met many of the upcoming honorees, all of whom have done, in their given field, heroic work for children and families. I met a poet who bared himself with a spoken word story that made me shiver; a basketball-dribbling, stiletto-wearing educator who advocates powerfully for kids; and a group of teenagers more self-assured and brave than I could ever have dreamed of being at their age. These people inspire me because of how they deal with fear. It’s not that they don’t experience fear, but they have been able to push it aside in order to pursue some very big dreams. I have been communicating a lot lately with my own fear. I recognize that when we allow fear to weasel its way in, we relinquish control of the pursuit of our dreams. In the next few months I am taking some risky steps, into new writing avenues and toward my creativity (where things can be pretty dark and scary). My fear has been whispering heavily to me, trying to psych me out. 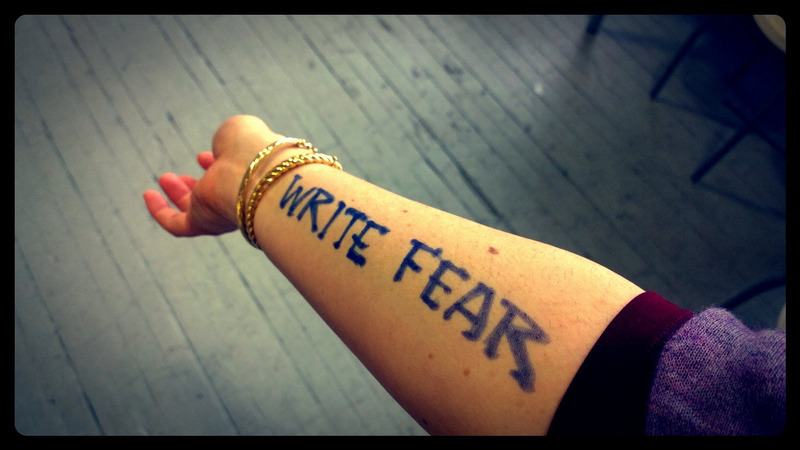 One of our heroes (the beautiful poet) had a bold tattoo on his arm that read KISS FEAR. It was decided that I would jump in some photos with him, and I had an idea to create a “tattoo” of my own that would create a fun interplay with the poet. The poet had brought his friend, the artist, who roughed out my new ink. It was dry-erase marker, so it’s already gone. But I have the hope that the act of branding myself, even for a few hours, with the dare to go all the way with my writing, to the deepest, scariest place, will stick. Writing or exposing ourselves is scary. I recently watched the video of the character who played Juno coming out in a convention. I watched as she was shaking with anxiety as she was standing in front of everyone. I mean, here is this celebrity afraid to expose who she is? I think in general our society doesn’t like talking about things. We don’t want to be faced with “real” issues. We cling desperately to the American Dream like it was our savior. Not wanting to say the words, “I’M NOT OK.” However, I have noticed in my own life, the more I expose myself, the more people do in return. This creates an environment where true relationships can be established. I volunteer at the dougy center which is a grief center for children. The main focus is that through shared experiences, people gain strength, and strength over time brings endurance, and endurance gives us hope for a new future not tied to our past. I look forward to reading more posts and glad you had such an amazing experience!